Noel Coward is a playwright who divides the generations. Whilst younger theatregoers see him as a figure from theatrical history, whose relevance had paled well before his death in 1973, older audiences tend to remember with nostalgia his easy and elegant wit, and the romantic comedies of a more innocent era. Other than “Private Lives” and, to a lesser extent, “Hay Fever” and “Blithe Spirits” his extensive oeuvre is rarely revisited these days so is it time for a reappraisal of his place in the canon? 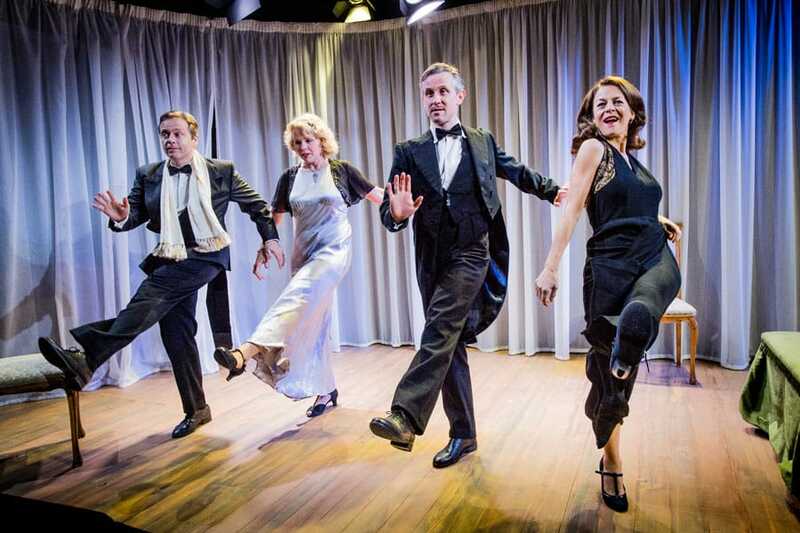 Clearly the Jermyn Street Theatre – finally gaining recognition for its brave decision to become a producing theatre despite its limited seating capacity (70) – thinks so, and is offering an ambitious nine one-act play cycle: “Tonight at 8.30”. One of the original ten plays “Fumed Oak” is, annoyingly for completists, omitted from the event and the other nine have been divided thematically into three groups under the theatre’s own headings: “Secret hearts”, “Nuclear Families” and “Bedroom Farces”. Each group is performed on different days but it is possible on selected days to see the entire programme. Spending a whole day, especially that rare treat which is a genuinely warm and sunny day in London, in a darkened basement is a thing of virtue but then the nature of this production is that it is an “event”, normally reserved to heavyweights such as Shakespeare. Which is not quite what these plays are. With the best will in the world these one-act plays, written purposely to revive the form, range mostly from frivolous to light entertainment. There is good observational writing and some sharp dialogue, especially in the nods to vaudeville and luvvies (“Star Chamber” – which also manages to lampoon the committee system -and “Red Peppers”), but the tone rarely drifts towards seriousness. When it does, ironically, Coward delivers one of the finest one-act plays written in the English language. “Still Life” despite its familiarity, continues to be a marvel of economy and understatement, a play which should be performed continuously, together with Rattigan’s “The Browning Version”, for anyone who wants to understand what English reserve and “the stiff upper lip” is (was?) all about. 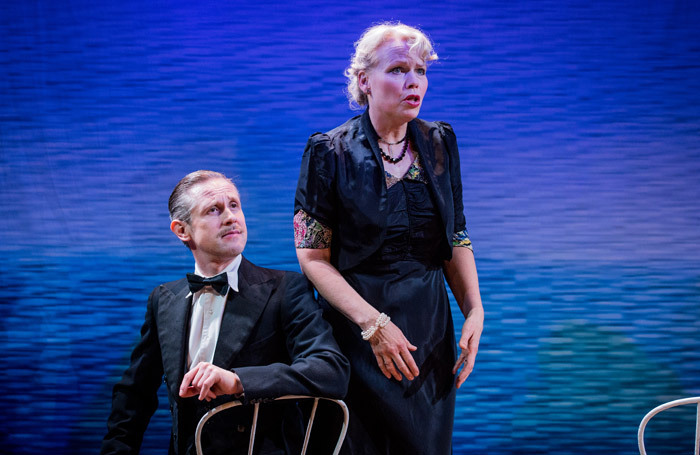 There is not enough variety of subject and mood in these plays to elevate this cycle from entertaining to meaningful but in the second cycle “Hands Across The Sea”and “Family Album” both offer two sides of family life ripe for comedy – social calls from barely-known people and a family funeral. The least successful trilogy is “Bedroom Farces”. The plays here were vehicles for Coward and his favourite actress, Gertrude Lawrence, and their debonair charm and overarching battle-of-the-sexes attitude are a bit tired and are missing the marvellous ensemble acting which is one of the joys of this production. “Shadow Play”, the most interesting of the three, is quite modern in its craft with its use of time and play-within-a-play device and is, together of course with “Still Life” the most persuasive argument for Coward as more than just an entertainer. Spare a thought for the cast of nine: what must it be like to have to create, in some cases, nine different characters in nine different plays? The cast here copes admirably and, together with the superb backstage team who effect some stupendous scene changes in front of our very eyes, are the stars of the show. It would be unfair to pick out any of the cast because this is very much a collegiate effort. None of them disappoints. This may not be Shakespeare or Ibsen but it is a hell of an entertainment. Whether it is effective in reappraising Coward is a moot point but it is unquestionably a worthwhile effort. “Tonight at 8.30” is on at the Jermyn Street Theatre until 20th May.